An Account of Several Workhouses... in 1725 noted the existence of workhouses at Wellingborough, Grendon, and [Earl's] Barton. A parliamentary report of 1777 recorded parish workhouses in operation at Wellingborough (for up to 70 inmates), Earls Barton (36), Bozeat (10), Wollaston (10), Finedon or Thingdon (36), Irchester (10), Irthlingborough (100), and Rushden (18). A seventeenth century building at the junction of Sunnyside and London End, now two separate dwellings, once served as the Earls Barton parish workhouse. 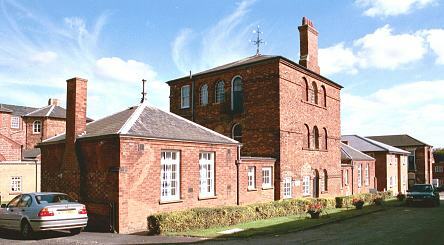 Earl's Barton former parish workhouse, 2004. County of Northampton: Bozeat (2), Earls Barton, Great Doddington (2), Easton Maudit, Ecton, Finedon or Thingdon (2), Grendon, Hardwick, Great Harrowden, Little Harrowden, Higham Ferrers (2), Irchester, Irthlingborough (2), Isham, Mear's Ashby, Newton Bromshold, Orlingbury, Overstone, Rushden (2), Strixton, Sywell, Wellingborough (4), Wilby, Wollaston. County of Bedford: Farndish, Poddington or Puddington, Wymington or Wimmington. Later Addition: Higham Park (from 1862). The population falling within the Union at the 1831 census had been 18,571 — with its parishes ranging in size from Strixton (population 69) to Wellingborough itself (4,688). The average annual poor-rate expenditure for the period 1833-5 had been £11,388 or 15s.11d. per head of the population. 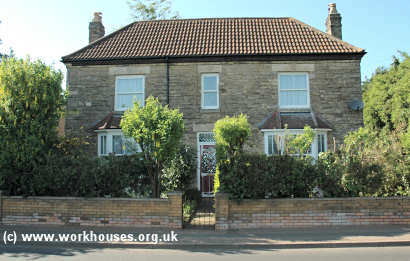 A new Wellingborough Union workhouse was erected in 1836-7 in Wellingborough at the south side of Irthlingborough Road (named Union Road for many years). It was designed by James Clephan who was also the architect of the workhouses at Ampthill and Saffron Walden. His design for Wellingborough adopted the popular cruciform layout but the buildings were distinguished by a degree of Italianate features such as round-headed windows. In 1836, the Poor Law Commissioners authorised an expenditure of £5,000 on the building's construction which was to accommodate 250 inmates. The building's location and layout are shown on the 1888 map below. At the centre of the main block was an octagonal hub which may have originally contained the workhouse kitchens. A block located in the angle between north and west wings could have been the dining-hall. Wellingborough main block south wing from the south, 2000. Wellingborough main block north and west wings from the west, 2000. Unlike the standard square plan, Clephan's design lacked a distinctive entrance and administrative block. However, the western side of the workhouse took on this role. A porter's lodge and Guardians' board-room were erected at the north-western entrance to the site. 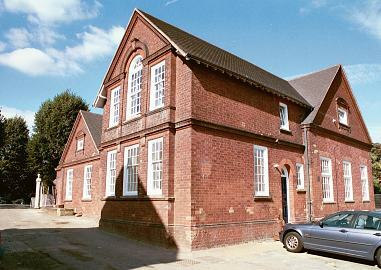 Wellingborough lodge/board-room block from the south-west, 2000. The western end of the main block had a number of later extensions added to it, and a separate block at the south-east corner included a mortuary. Wellingborough west wing of main block from the north-west, 2000. The infirmary complex at the south of the workhouse was built in several phases. The first block, nearest to the workhouse, dates from 1875. Wellingborough 1875 infirmary north block from the south, 2000. Two additional infirmary blocks were added further to the south in about 1897, and a further one at the east in around 1928. Wellingborough 1897 infirmary blocks from the north, 2000. The later layout of the site is shown on the 1925 map shown below, by which time the workhouse had officially become known as Wellingborough Poor Law Institution. 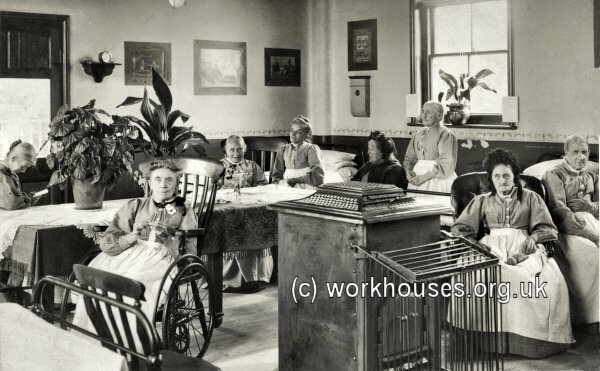 Wellingborough workhouse — elderly women's dayroom, early 1900s. After 1930, the workhouse site was officially known as Wellingborough Public Assistance Institution but in 1938 was renamed Park Hospital. It catered mainly for the elderly and had two units for the aged sick — "The Home of Rest" and the "Castle Home". There was also a maternity unit. 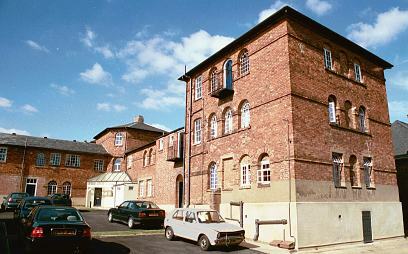 The site was later became Isebrook Hospital but the former workhouse buildings have now been converted to residential use. Wellingborough operated two cottage homes sites where pauper children were housed away from the workhouse. 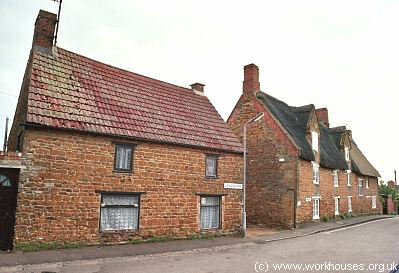 One was at Finedon, and the other, known as 'Rockleigh', was on Wellingborough Road in Irthlingborough. Each could house 12 children. In 1924, the Finedon home was superintended by G. Macdonald and the Irthlingborough home by M.H. Browning. Northamptonshire Record Office, Wootton Hall Park, Northampton, Northants, NN4 8BQ. A wide variety of records survive including: Guardians' minutes (1835-6, 1865-30); Admissions and discharges (1896-1933); Births (1867-1914); Deaths (1867-1914); Creed register (1869-1930); Bathing register (1929-32); etc.